Trunks are handy for swimmers and for elephants. But trunks also are making their way to schoolchildren across Montana. These plastic trunks—made from recycled materials, of course—are filled with information on how to recycle stuff that people otherwise would toss into a trash can. The nonprofit group Recycle Montana has distributed dozens of trunks to schools across Montana under a program that began two and a half years ago. One fan of the trunks is Candi Zion, a Winifred area rancher who serves as president of the board of Recycle Montana, which advocates for recycling in Big Sky Country. Zion has had a chance to use a recycling trunk while substitute teaching at the Winifred school. “I think it’s really cool,” she says. “The kids like all the unique items made out of recycled materials.” Among them are 33 aluminum cans squished together to create a miniature metal bale and 125 sheets of paper shredded into a bound bale. Both bales are 8 inches square and up to 5 inches deep. The man in charge of making the small bales and assembling the trunks is Kirk Treece, executive director of Recycle Montana, based in Missoula. A former board member, Rob Pudner of Bozeman, suggested the group offer a trunk program to schools. Businesses or individuals can sponsor a trunk for $250. “It can be the school of your choice,” Treece says. For instance, one sponsor of the trunks in Great Falls, Steel Etc. businessman Joe Filipowicz, asked that trunks go to four schools in the Electric City: Mountain View and Meadow Lark elementary schools, and C.M. Russell and Great Falls high schools. Treece and his family were busy assembling trunks over the winter after gaining the big grant from the beverage associations in December. Bales are created using a small baler the nonprofit group purchased, and T-shirts are filled with rice. So far, schools in more than 40 counties have received or will get trunks by early spring 2019; Montana has 56 counties in all. Some 90 trunks have already been distributed or are spoken for, and it’s expected the trunk program total will reach the 100 mark in the coming months. “Most people are really, really happy with it,” Treece says. Teachers are provided lots of information, too, because each trunk includes a 300-page binder explaining its contents and potential lesson plans. “A lot of the rural schools have asked for the trunks,” Zion says. If a sponsor is available, a school can obtain a trunk. 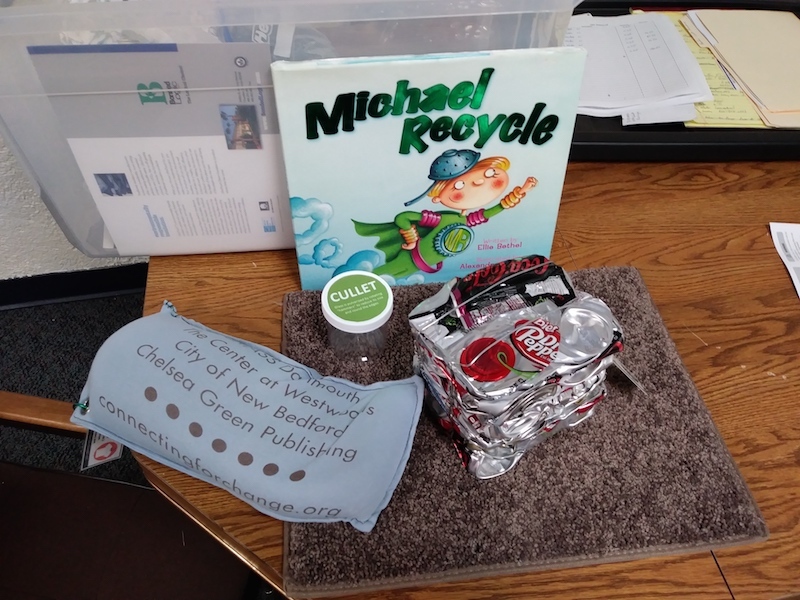 Recycling locations aren’t always available in towns, but Winifred area residents nevertheless have options to recycle items such as aluminum cans and cardboard. And while there are no large recycling centers in the far-flung town of Ekalaka, where one trunk went, school officials, teachers, and students at Ekalaka Public Schools still are interested in how to reduce the amount of trash sent to landfills. “They may not be recycling everything, but they’re doing what they can,” Treece reports. Recycling has a high profile not only in urban areas but in many rural states as well. Recycle Montana plans to continue offering its recycling education trunks to schools for at least another year, if it can secure additional sponsors. “It has not been a hard sell,” Treece says. For more information about the recycling education trunks, contact Recycle Montana at (406) 461-9106 or email Recycle406@gmail.com.